Many people know that nettle tincture has a positive effect on hair growth, it gives strength and density to hair. This natural product is used since ancient times for the care of the scalp and we can say that this is a proven remedy. If you notice that nettle is growing in your yard - do not cut it but let it grow and it will give you the best it offers you will improve your health. It most successfully cures dandruff, oily or dry hair prone to falling, prevents cracking of the scalp, but also strengthens the roots of hair. To do that, it is necessary to use an adequate product which is prepared in a completely natural way. If you are interested in how to make a nettle tincture for hair, learn how much it is actually good to use and what kind of results you will achieve. Nettle is a medicinal and useful plant that is treated in a wrong way by a man. You must remember that you got burned by its leaves many times, and you remember its uncomfortable feeling. Some people cut it because they feel that their growing weeds will destroy the appearance of the yard. This is all wrong and do not remove this precious gift of nature, it can be of great help to you and your family. The nettle is known to contain large amounts of valuable minerals. Among the most notable are iron, magnesium, potassium, sodium, calcium and phosphorus. Their combination is necessary for each of us, as it helps in the fight against anaemia and strengthens our blood. Therefore, everyone who suffers from anaemia, should use nettle tea. In addition, the nettle is useful for strengthening the immune system, as it contains vitamin C and A. Nettle tincture (just a few drops) is diluted in a glass of water and is very useful in the transition period (winter-spring and summer-autumn). If you drink it every day, you will be protected from the cold, allergy and cough. Excess fluid in the body is effectively solved with the help of this plant, and there is evidence that it is useful as a protection against cancer. Why is nettle good for hair? Somebody must have already told you how good nettle for hair is. All this praise certainly has coverage because this plant is very healthy. It has beneficial effect that is best expressed when it comes to care of the scalp. Nettle tincture for hair loss is the best natural cure for this problem, and you can make it yourself. This way you will be sure that you will not treat scalp with harmful and expensive chemical preparations. This powerful product works not only by stopping and preventing hair strands. In fact, this is a great tool for hair root because it gives it the necessary vitamins and minerals that will encourage faster hair growth. Many women are concerned about whether their hair grows fast. Therefore, nettle for hair growth is recommended because it works effectively deep into the hair follicle and gives it the necessary nutrients. The great problem is dandruff, which can often occur together with increased greasing of scalp. This is a very frustrating experience, and because of it the vast majority of people resort to various chemical preparations. Because of these preparations this problem disappears for a short time and comes back after, causing that your scalp no longer responds to an expensive shampoo that you bought. What to do then? The best and the only natural solution is nettle against dandruff, because it does not irritate the scalp and deeply cleans away excess fat. If your choice are drops of nettle, use of this product is very simple. It can be used locally, so every day you drop couple of drops on the root of the hair and rub it with the hands. Gently massage the scalp until it absorbs and do not rinse it but let it act. Simply, in a glass of water or tea, pour ten to fifteen drops of this natural product. Stir and drink three times a day, always 20 minutes before a meal. 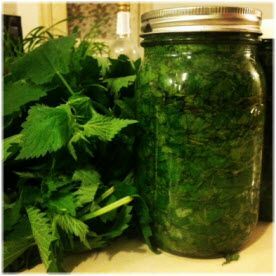 If you are wondering how to make nettle tincture in the simplest of ways, to begin with take a walk outside in the nature. This plant can be recognized by the characteristic green leaves that are slightly jagged at the edges. Better yet you will notice it is if you touch it and to avoid getting burned wear gloves. Nettle is plucked together with the stem and the root and feel free to take as much as you like, because more is better. At home, wash the whole plant to remove all dirt and any insects. We encourage you to prepare this preparation while using the whole plant, not just the leaves. Then, with the knife cut into small pieces, and the amount that you should be eating is around two full cups. The next ingredient that you will need is brandy. Pour brandy over a finely chopped parts of the plant in a glass bottle and seal the cap. Leave the bottle to stand for 15 days, and you must shake the bottle on a daily basis during this period. After two weeks, tincture should be strained through a strainer or cheesecloth. Keep it in a glass or plastic bottle, which is darker in colour, and is not advisable to leave it in the place that is sunny. Do not refrigerate, but at room temperature. What will many be interested in is when not to use this product, and what people cannot use it. Since women who become pregnant often suffer from anaemia due to lack of iron, it is very important at the time to work and restore the levels of red blood cells to normal. Nettle drops during pregnancy can be used and their application does not have a negative impact. However, it is necessary to consult a physician who will give their opinion in accordance with the findings of blood. Also, consult with an expert if you plan to drink homemade nettle juice. Can nettle be given to children? The children often suffer from anaemia, and parents are free to make nettle tea for children. This drink is very effective and for a short time there are visible signs of improvement and recovery. If the child by any chance does not like the taste of tea, you can use diluted nettle tincture. In this case, it is sufficient to drop some 10 drops in 2 ml of water. When it comes to adults, the dosage is slightly higher, up to 15 drops in the same amount of liquid. When it comes to nettles tincture, people's experiences are very positive, especially for those who have problems with hair loss. If you inquire among your friends or look on the Internet, you will see that they all realize that natural products like this one are the best. To me nettle drops are perfection! I used it only for hair loss that was thin and greasy. After only five days of local usage I noticed that the hair loss was reduced, and after two weeks new hair started to grow. I now regularly buy it and I am very pleased with it. I cannot describe how much nettle tincture helped me for hair that was practically dead. To me and my mom it started taking effect after 10 day. Before that we were both plagued with oily and cracked hair that was very thin. Now the hair is noticeably thicker, and combing is no longer a nightmare. I regret I used all sorts of expensive shampoos, masks and lotions. They irritated the scalp that was itchy, but at the same time, abnormally greasy. Dermatologist sincerely recommended that I try nettle drops for hair, and its low price was funny to me. I bought one bottle which for me was a revelation and it gave me a much-needed relief. The scalp already after three days was no longer itchy and not greasy to my delight. I continue to use the unavoidable nettle shampoo with ad drops. If you decided to buy quality nettle drops the price is very affordable, and you will for a pack of 30 ml set aside about 3 dollars. They are available in all health food stores and pharmacies. In addition, you can order them online through various online shops. We note that you always read the composition on the labels of products and inform yourself well before buying. Although it is a truly medicinal preparation, you might ask, does the nettle tincture cause side effects. Very rarely side effects occur which are the result of interactions with certain drugs. So, if you are using blood thinners, avoid taking this product. Consumption of nettle drops is not recommended to those who apply the therapy against low pressure. People that use antidepressants and medication for diabetes are advisable to consult with a doctor if they want to drink this mixture. When it comes to local use, in very rare cases nettle tincture causes itching of scalp that passes easily, because it is a product based on alcohol.